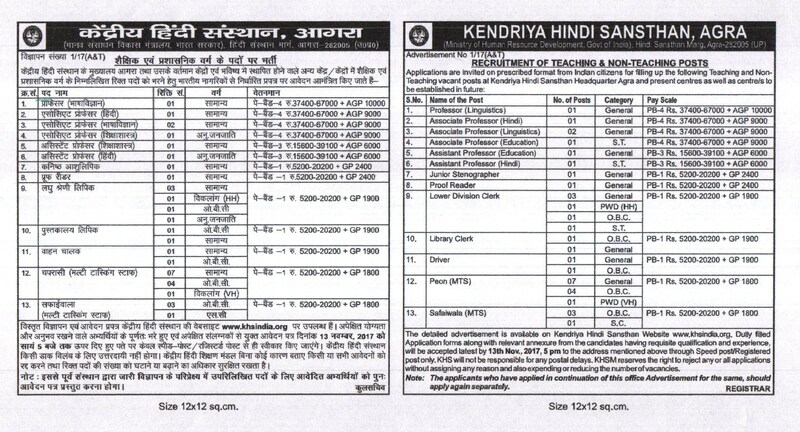 A latest career related advertisement for Kendriya Hindi Sansthan Recruitment has been liberated by Kendriya Hindi Sansthan to inform the Goal oriented and skilled Aspirants for the 35 Vacancies of Clerk, Professor, Stenographer, Peon. Eligible Jobs Hunter can apply for Kendriya Hindi Sansthan vacancy by submitting application form before last date which is 13th November 2017. Qualification Required: Job searchers should have 10th / 12th / Graduation Degree / Post Graduation Degree or equivalent examinations from any recognized board / institute. Contenders who are interested to apply for any of the above mentioned positions they should be in between 18 to 27 Years (Post 4,6-8), 18 to 25 Years (Post 9). Maximum age limit for the applying candidates is 30 Years (Post 5). Salary & Pay Band: Appointed aspirants for Clerk, Professor, Stenographer, Peon posts will get remunerations of Rs. 37,400 - 67,000/- With 10,000/9000/- Grade Pay (Post 1,2), Rs. 15,600 - 39,100/- With 6000/- Grade Pay (Post 3), Rs. 5200 - 20,200/- With 1800/1900/2400/- Grade Pay (Post 4-10) which is offered by Kendriya Hindi Sansthan. Selection of applicants for Clerk, Professor, Stenographer, Peon Will be based on Written Exam, Skill Test. First of all appliers you have to open the official site of the organization that is http://www.khsindia.org. Closing Date to Submit Hard Copy of Application Form Is : 13-11-2017. Check Kendriya Hindi Sansthan Recruitment Notification Here.